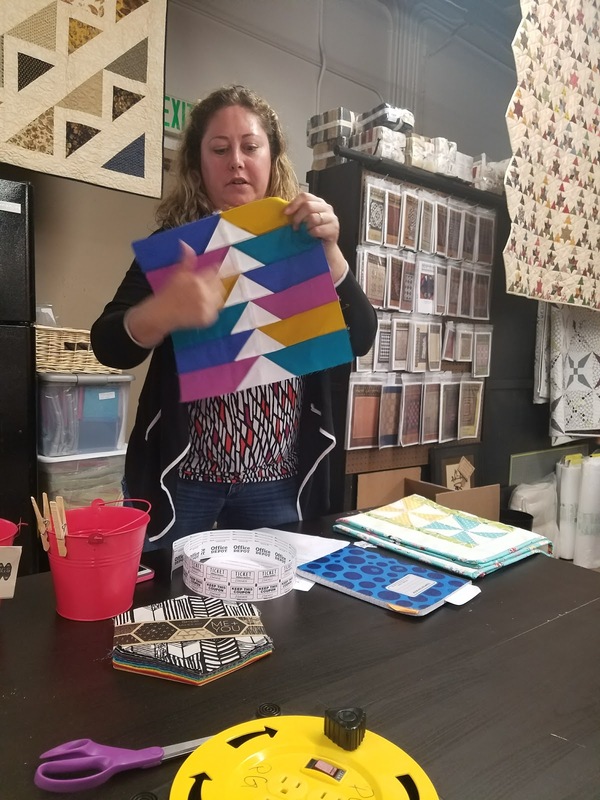 Our Show and Tell started off with Linda. She brought in her quilt top made from a layer cake she won at last month's meeting. What a fast and fabulous finish! I shared a Tula Pink quilt I won through an Instagram giveaway. 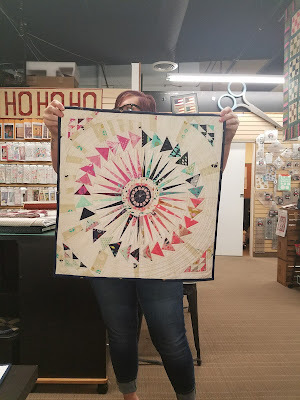 I was so excited to win it, especially since it was signed by Tula Pink herself! The giveaway was done through @sewkindofwonderful, who also made the quilt). 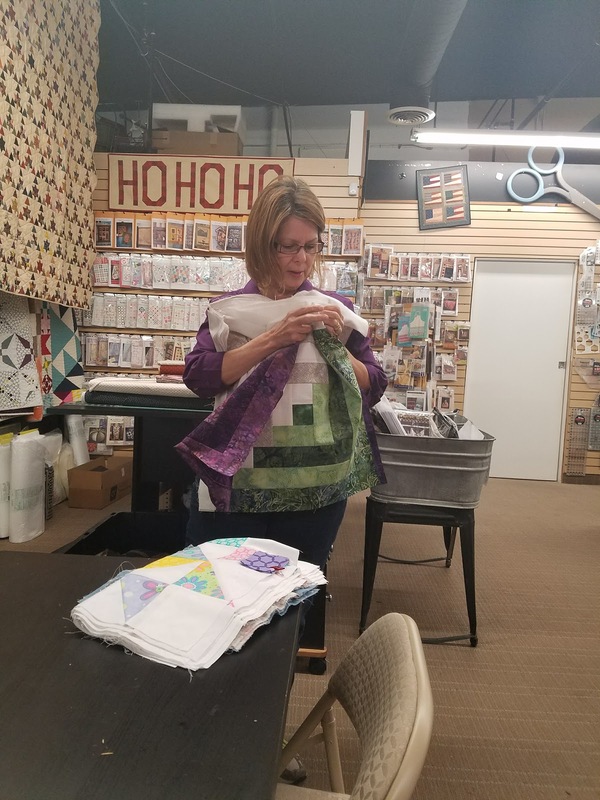 Susan brought in a mini quilt she made from scraps. She also took a stab at hand embellishment (which she says she'll never do again). 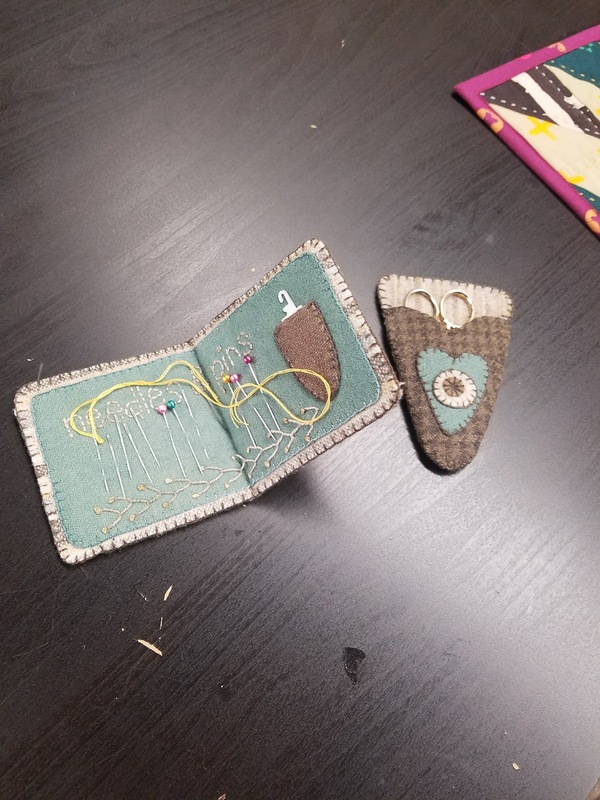 Susan had purchased a kit from Primitive Gatherings that made a felted wool applique pin cushion, a scissors holder and a pin holder. 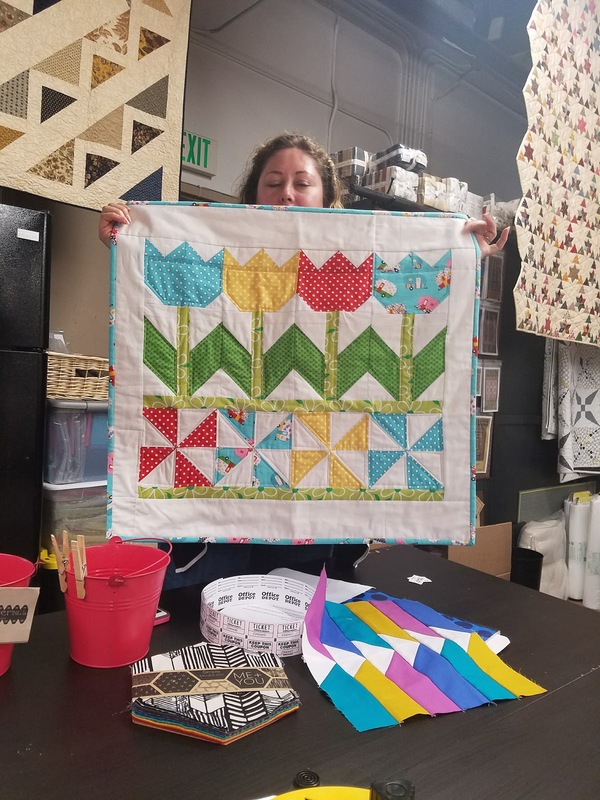 Colleen told us about how she's in the process of moving her studio to another room in her house, which meant she had to take down all her mini quilts from her wall. 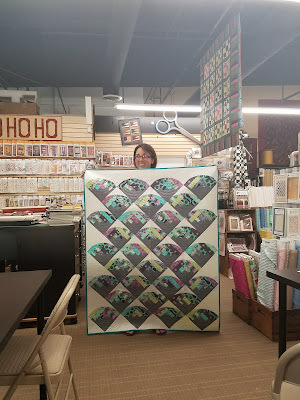 She brought two of them in to share. The first was an adorable postage stamp mini she made a while back. 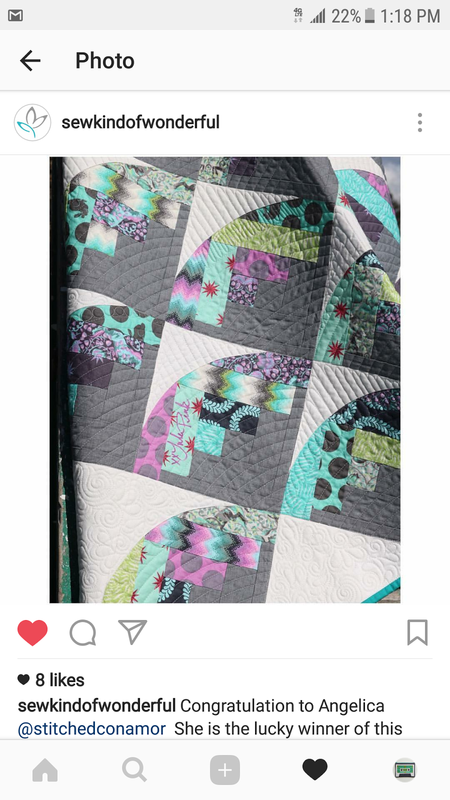 The second mini quilt was one of her favorites which was made by someone on Instagram for a Cotton + Steel mini swap. And the back looked just as cute! 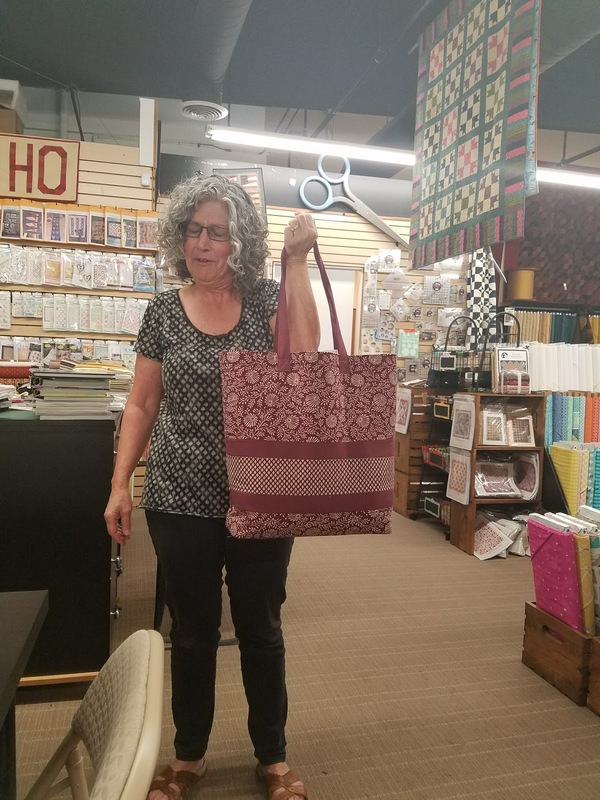 Patti brought in her new tote bag she just recently made (her old one was stolen!). 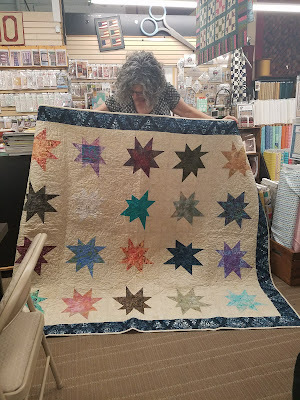 She also brought in a cute baby quilt and a batik wonky star quilt. 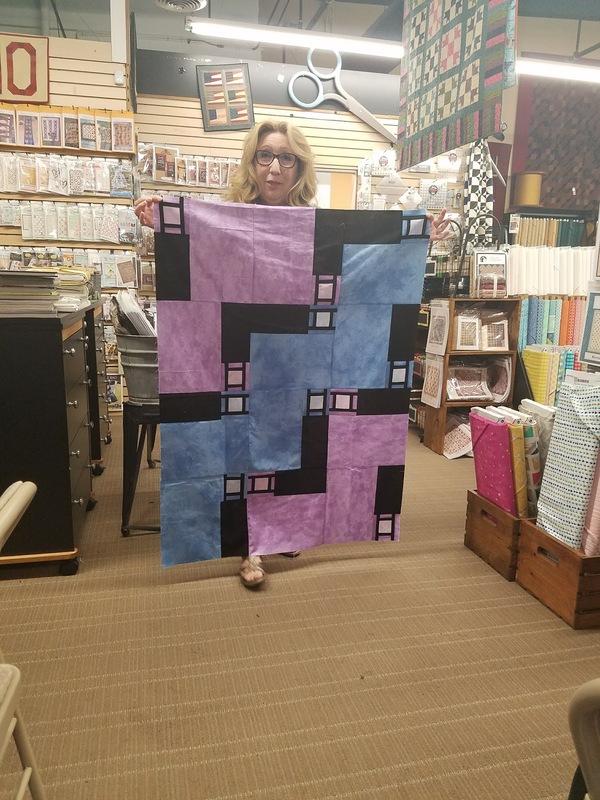 Judy brought in her "Room and Board" quilt blocks she's been working on . 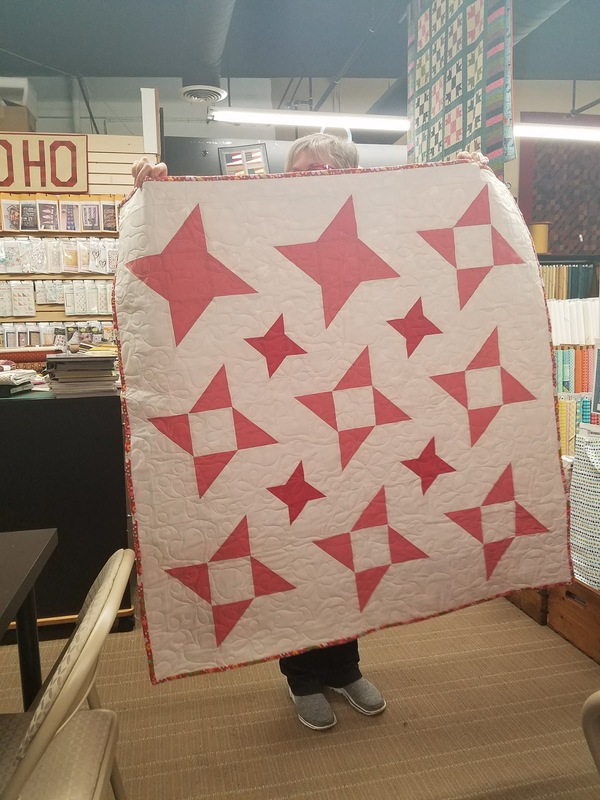 She recently taught her 9 year old granddaughter to sew and she helped her put this large block together. And she showed us her first quilt she ever started back in 1989. They were "quilt in a day" blocks. Natalie brought to the meeting this cute wallet she made from a kit she purchased while at Road to California. 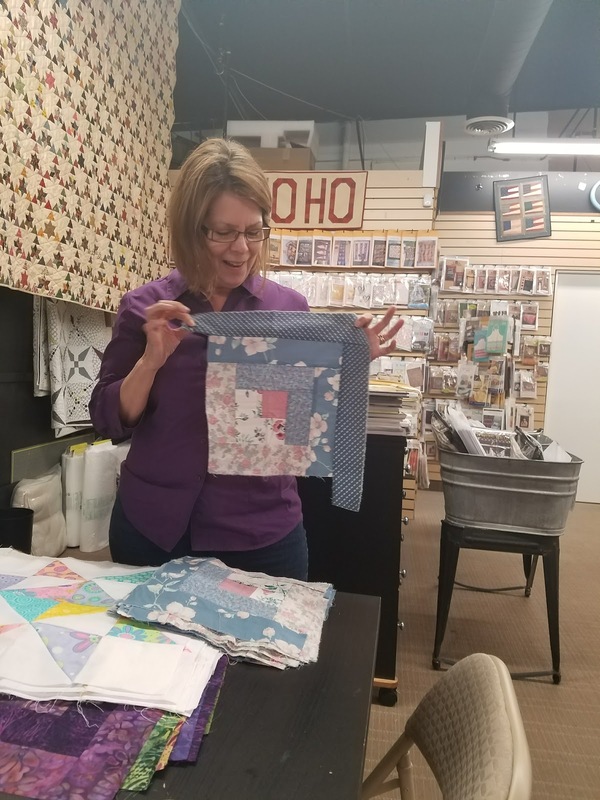 Nancy brought in a baby quilt that started out as her entry in the Solids Challenge (that ends next month). 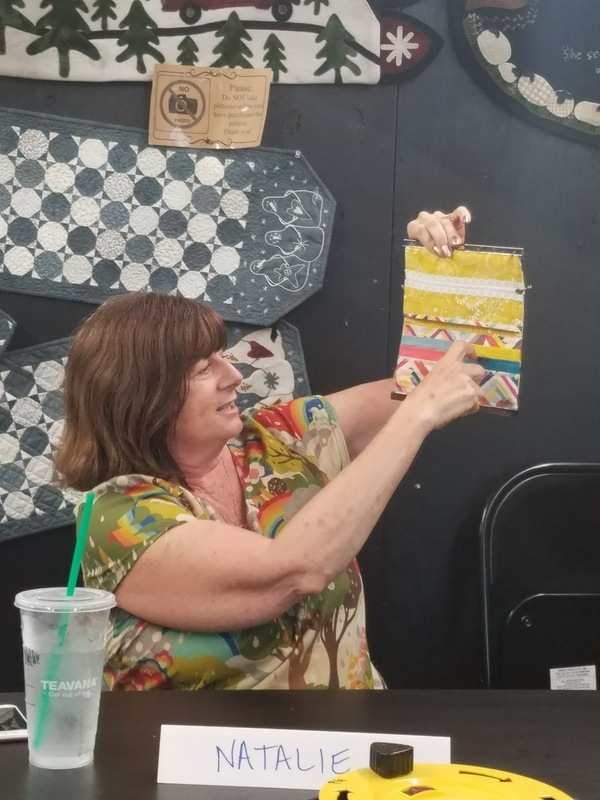 She decided to add a pretty floral print for the binding and the backing. 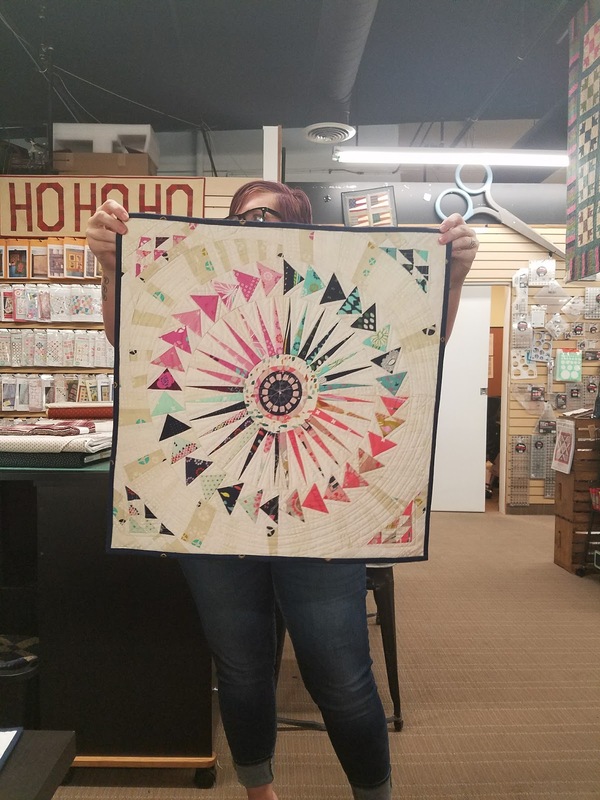 Maritza brought in an adorable quilt top made from a panel (middle section) she purchased at Road to California. The bottom section was pieced and the top section was appliqued to match. 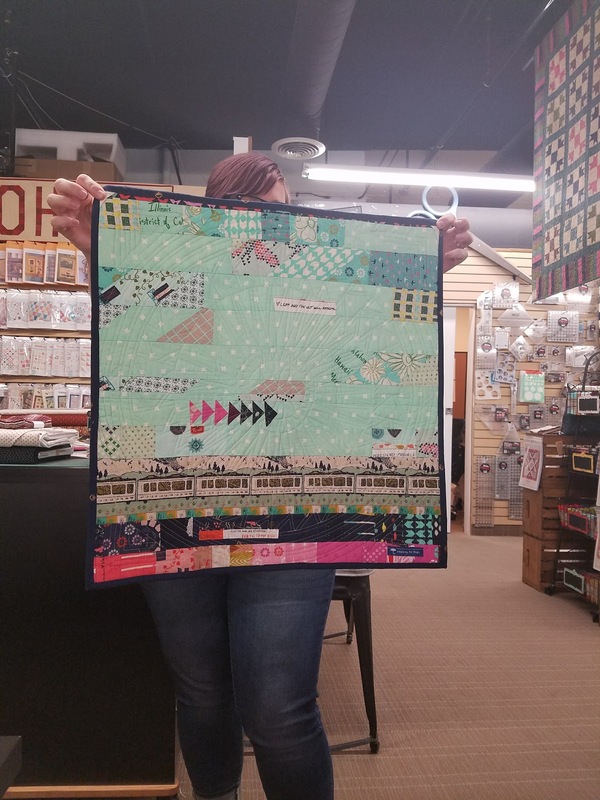 This quilt she made using the block of the month she did for The MQG in January! How cool is that?! Jessica shared with us a flying geese block she made using solids. After show and tell, Colleen introduced next month's Block of the Month, which is called the Double Pinwheel. Her tip was to use the Bloc-Loc to trim the half square triangles (or HSTs). 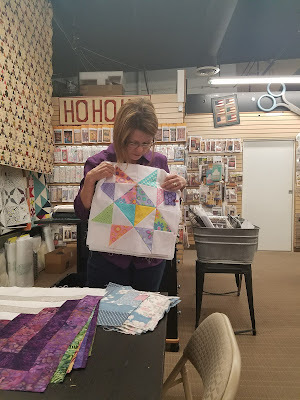 The Demo for the evening was brought to us by Colleen. 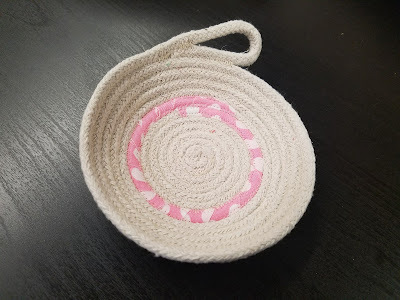 She showed us how to make these beautiful rope bowls. 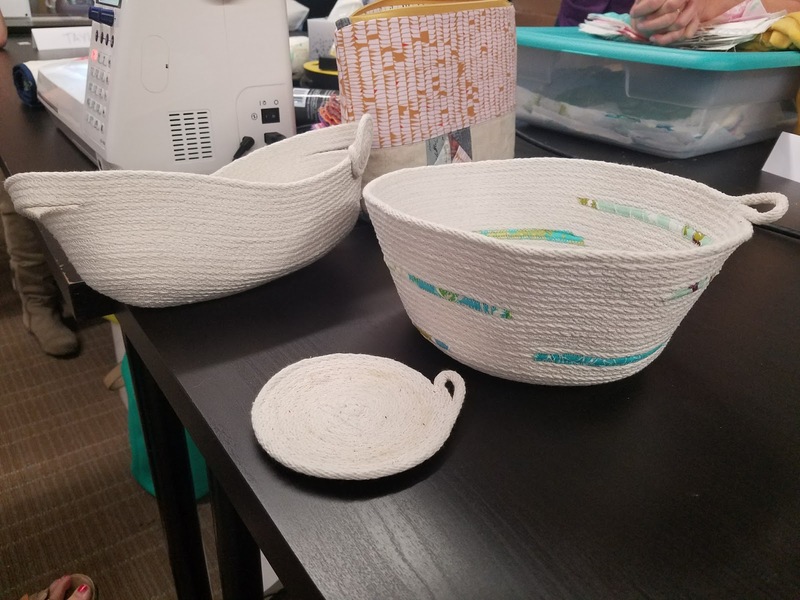 She went over the different sizes one could use to make these and how to start and finish a rope bowl or coaster. 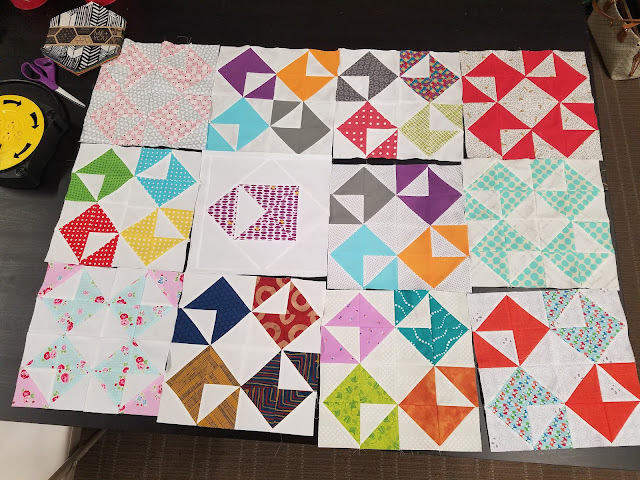 Here are all the blocks we collected. So many pretty envelopes! Next month's meeting Jan will be back with us. We will be meeting on May 18th at 6:30 at Primitive Gathjerings. Remember to bring in your BOM blocks from this meeting (see Tutorials tab for details on the May Block of the Month). Hope to see you all! This Month's interviewee is Susan Long! I emailed her a set of questions to tell us more about herself and she emailed me back this beautifully written introduction of herself. Enjoy! Hello! My name is Susan Long. I have been quilting about 3 years, however I began sewing about age 10. 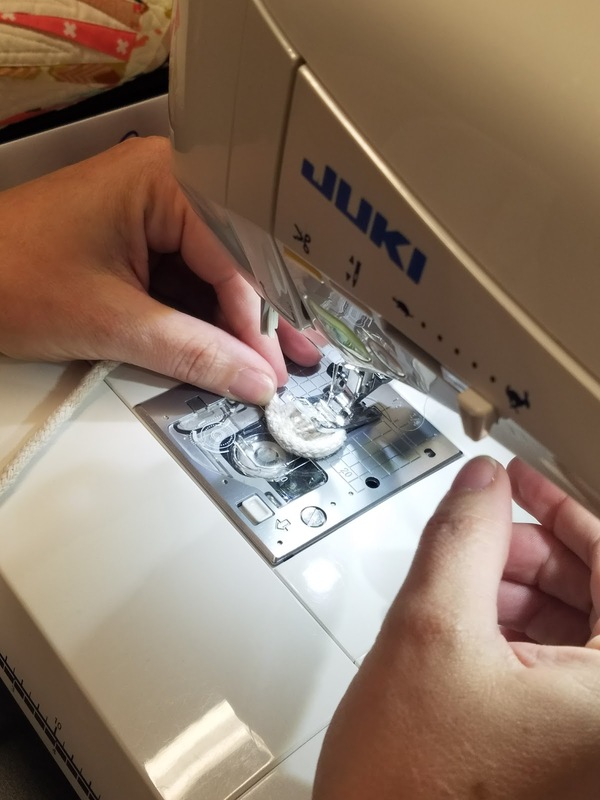 I used to sew all my clothes including my wedding dress and that of my sister. 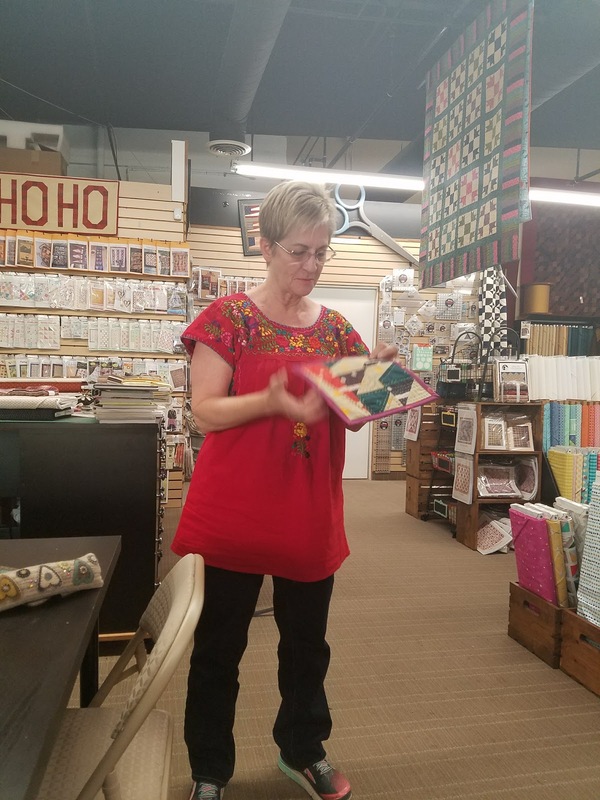 My first real job was working in a small fabric shop. I’m an arts and crafty girl: knitting, crochet, acrylic painting, beading, photography, and anything else that peaks my interest. I recently retired from a 35 year career as a sonographer (ultrasound). I loved my work, but I longed to see our country. During the last year my husband and I have visited many national parks and monuments, where we like to day hike. I hope to see all 59 national parks! I joined TVMQG during its very first meeting last year. I was excited to network with other modern sewers, meet new friends, and do charity work through sewing. 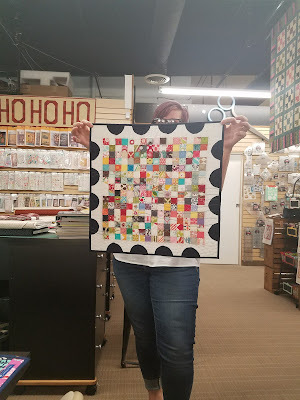 This second year of the guild I am serving as the keeper of the charity blocks. I am very much enjoying making charity blocks that will go out into the world to comfort others. Instagram is the only social media I participate in. My handle is @callmesusan. Please do follow me if you would like. I get a lot of inspiration from the people I follow. 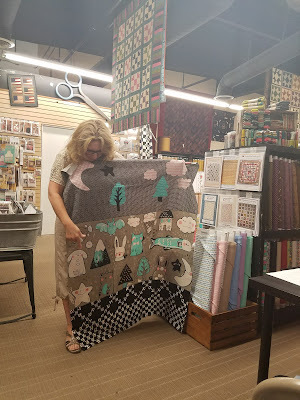 Sometimes, however, I feel overwhelmed by the amazing work I see others doing. I have to remind myself to stay MY course and do what I do, with the skills I have. As you can see from my picture, color sparks joy in me! My favorite quilt projects have all been improv. I enjoy completing my quilts by quilting them myself. 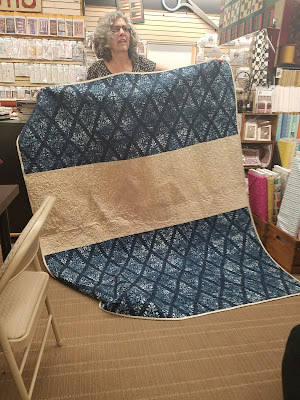 Sometimes I do straight lines, and often I go free range and do improve quilting, too. 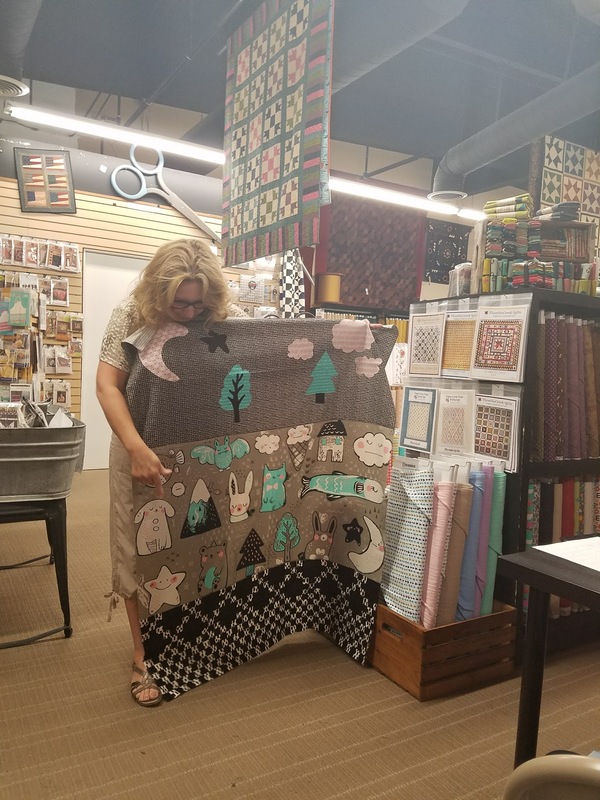 I often allow my quilts come to life organically. 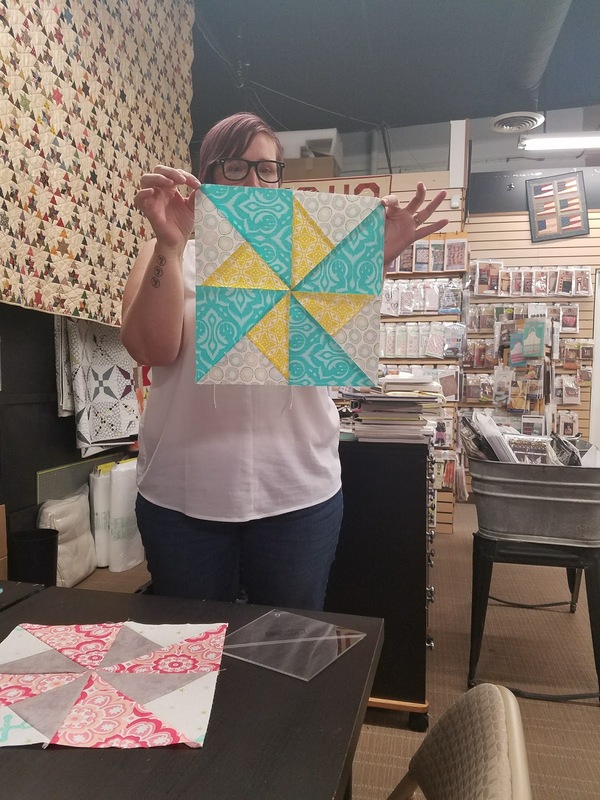 I don’t get as much pleasure from patterns that require precise measuring and piecing. 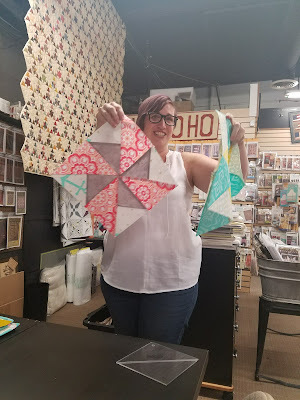 And, I love working with scraps! I am not a fan girl. 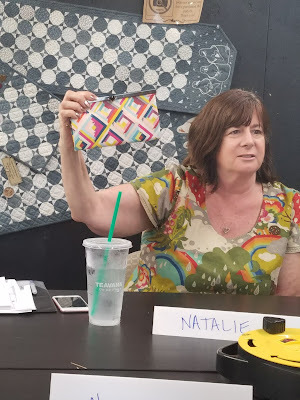 However, I admire the works of (Instagram handles) @entropyalwayswins, @messygoat, @persimmondreams, @cindygrisdelaquilts, @spontaneousthreads, @astrangerview, @slostudio, to name a few. I don’t get starstruck by anyone. (Although I did have a mad girl-crush on Shakira back in the early 2000s when I listened to her music while I was studying Spanish at university.) 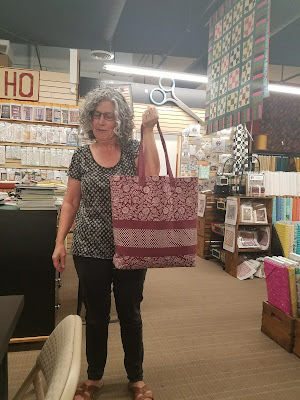 Along the same vein, I don’t obsess about fabric lines. I simply like almost all of them! 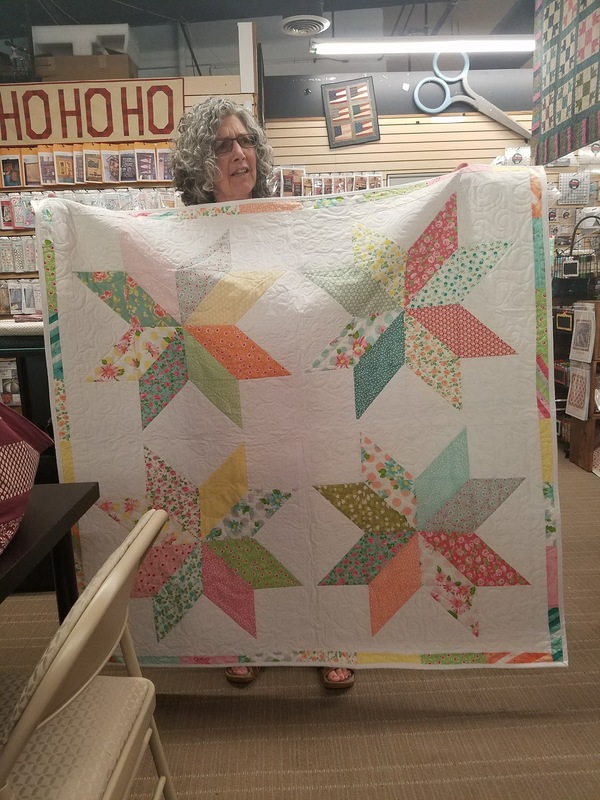 Two blogs I like are Posie Gets Cozy and Cozy Things. In my tiny house I have been sewing in the livingroom and have my sewing strewn all over the place. My design wall is 8x8 feet and is on the wall in our entryway. I love it! This past weekend my daughter moved out, so I commandeered her room as my new sewing space. 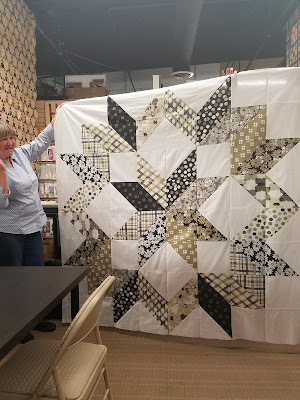 Still, I don’t want to be tucked away all the time, so I’ll probably continue to piece and sew garments in the living room. I love my huge TV! Below is a photo of my brand spanking new crafting room. I like modern quilting because of the colorful and free nature of it. I would like to see our guild to continue support and celebrate the work of all members. 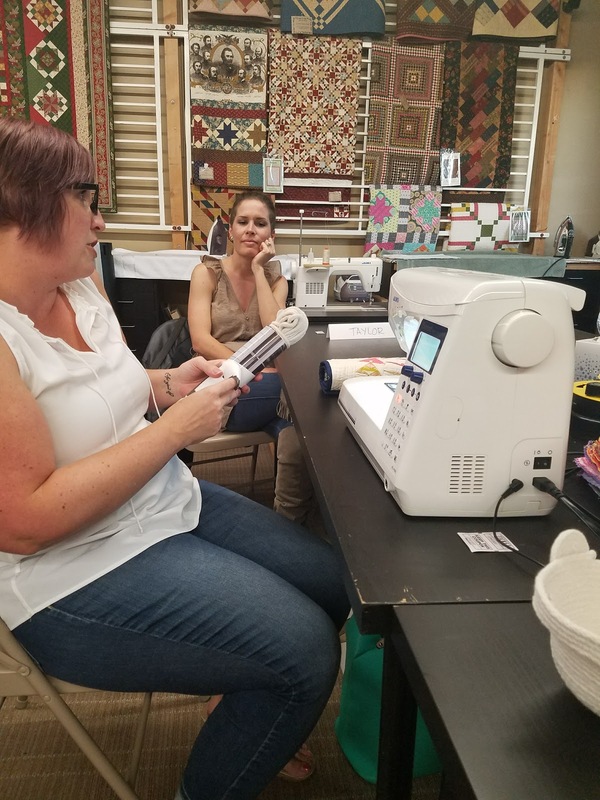 I am interested in workshops/demos in which I can learn new skills. I enjoy the sharing of ideas between members, because I learn so many great tips. I hope that one day soon we will be ready to plan a weekend retreat. That sounds like a lot of fun.